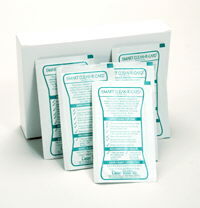 These ready to use Cleaning Cards are uniquely designed to clean Smart Card and Chip Card Readers. Their length and bowtie design allow the card to slide side-to-side while inside the Reader to effectively clean your equipment’s chip reader and magnetic reader heads. The main reason for Smart Card Reader failure is due to lack of maintenance. Depending on your machine’s environment and use, it may accumulate dirt, metal, and magnetic oxides that will eventually cause corrosion and Reader failure. Avoid costly repairs and frustrated customers. Keep your Smart Card Reader performing like new. These Smart Card Reader Cleaning Cards are safe, easy and effective. (1) Open pouch and remove the Smart Card Reader Cleaning Card. (2) Insert the Smart Card Reader Cleaning Card into your Card Reader just like you would a Smart Card. (3) Slide the Smart Card Reader Cleaning Card in and out and side to side approximately 10 times. (4) Remove the cleaning card from the Reader and allow a few seconds to dry. (5) Reinsert the cleaning card and slide it in and out and side to side approximately 10 times to remove stubborn contaminants. (6) Remove the Smart Card Reader Cleaning Card from the Reader and throw away. Note: If after completing step 3 the card is completely soiled, repeat the entire process with a new card. We recommend performing this maintenance every week on outdoor equipment and every 2 weeks on indoor equipment, but this time frame may need to be changed depending on your Reader’s usage and environment.